Have you ever talked to someone on a diet like cutting out carbs, substituting meat with other protein-rich food, or any other? Here I don't mean all those people who say they'll be starting next Monday, but end up never doing it. I'm talking about those who are motivated to getting closer to their goal. Those people. Do you know the toughest challenge they all share? After losing some weight or fat, they struggle in keeping their gains. Believe it or not, websites aren't much different from that. At least, websites that need to keep delivering and addressing your business needs in the best possible way. As people on specific nutritional regimens, who keeps track of everything they eat regularly to gather relevant data about their diet, you as a website owner should do the same. Did you install a new plugin to capture more leads? You'd need to keep your speed in mind because slow pages scare visitors away. Is a new field in your purchase form exposing your user's credit card info? Well, that should never happen! Is your website (or some sections of it) down because something happened but you have no clue yet? A big alert should be sent your way so you can act in a timely manner. Building up your website, or eCommerce really is just the beginning of your business journey. After that initial stage, when all is live and kicking, your focus should switch onto keeping your website up to your needs. So how can you regularly collect valuable data for your website? What free tools could you use? First, let's start with what type of info and data you should collect and assess on a regular basis to keep your business website running smoothly. Let's dig into them one by one. A website down is the nightmare any website owner dreads because it isn't always possible to get it back online fast. Sometimes it's just one of the most common reasons that brought your website down, but other times they're hard to find. Because of its importance and its impact on your business, uptime/downtime monitoring should be your first element on your list today. Uptime Robot allows you to monitor up to 50 sites with intervals of 5 minutes check in. Other than that, you'll be able to check your HTTP/HTTPS status, ping your servers and also monitor ports useful for your smtp or DNS for example. As one of the most famous online monitoring tools, Pingdom has to be mentioned because it provides several data types and insights. Even if they changed their free plan at the beginning of this year, they're still offering a useful set of tools and you can have 1 single website monitored, along with a nice dashboard and response time history. Uptimia is something I haven't tested thoroughly but sure looks interesting, at least for its appealing dashboard. On their free plan, you'll be able to set up a 1 uptime monitor and have it testing through 5 different datacenters on 5 minutes interval. When things go wrong, you want to know as soon as possible. And, sometimes, the old-fashioned way to get info is just the best one: text messages. Many of these tools charge you for each SMS notification or they don't offer it through their free pricing tier that's why Monitority might come in handy. Even if still in beta, and you'd need to grant access to your Google profile data, you can quickly set up an uptime monitor and get a free SMS notification each time your website goes down. They're also providing the most frequent uptime check frequency (down to every 20 seconds) when compared to others' free offerings. 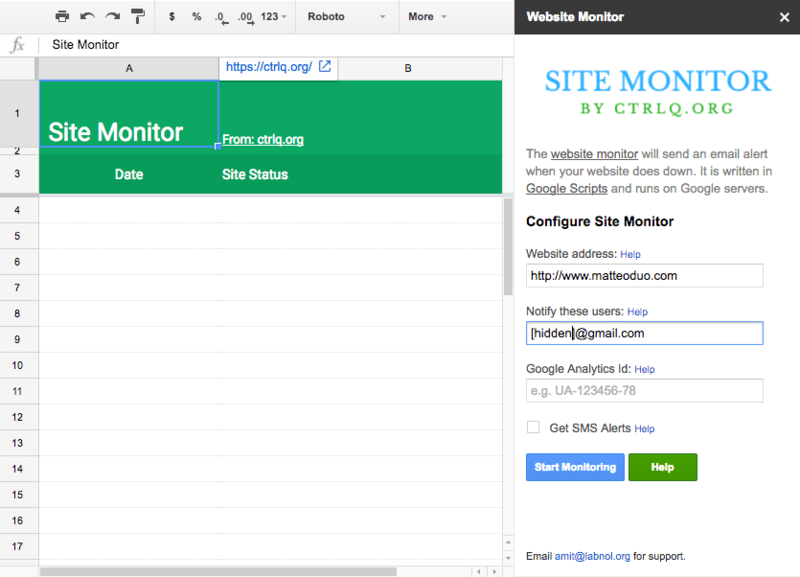 If none of the above tools look interesting and you're more of a do-it-yourself kind of person, Amit Agarwal came up with an interesting solution for you: a Google script that would do the monitoring for your website and log events in a spreadsheet and Google Analytics. This script might come in handy also to check your hosting provider performance with other data you've collected. Now that you know how to monitor whether your website is up and running, it's time to look at another key aspect: speed and uploading time required by your pages. Your website speed is a two-faced beast you should regularly monitor because it directly affects your SEO rankings and can have a major impact on conversions (hence lower your rankings because of low click-through rates on some of your pages). LEt's just leave SEO out for a second and try to think about how you usually browse websites: how long do you usually wait for pages to show up? Have you ever left websites/eCommerce stores that took "too much" to load their pages? I bet your answer would be affirmative. Well, that's why you should check your website speed on a regular basis and here are some free tools to start with. A pretty useful tool for checking your website speed is the one provided by Google. Thanks to PageSpeed Insights, you'll be able to get your website speed (desktop and mobile versions) tested and graded on a scale of 1 to 100 along with specific hints you should take action on and fix (or ask a professional to do that for you). 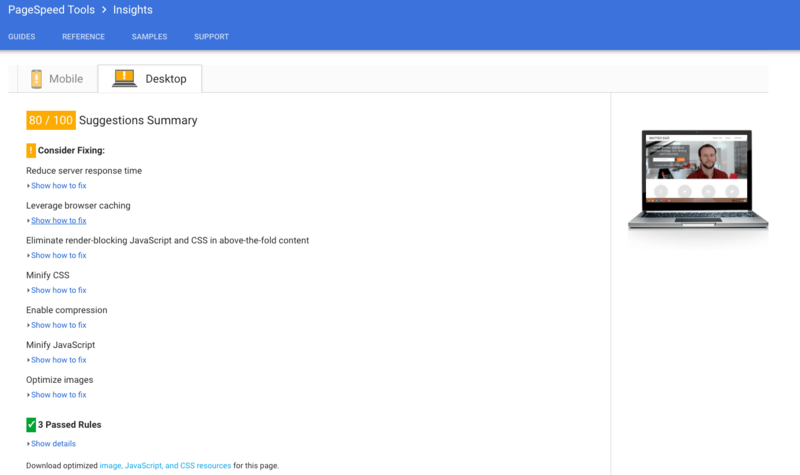 As Google explains, this speed tool measures how the page can improve its performance on a) time to above-the-fold load and b) time to full page load. Another pretty interesting tool here is Pingdom's website speed test, which will enable you to test a given website from 4 different locations (two in US, one in Australia, and one in Europe) and provides you with a quick overview at the top of the page, followed by tons of granular data. Bundling two different services, which use different recommendations when analyzing URLs, GTmetrix is an interesting tool you might want to try to collect even more granular data. Specifically, with GTmetrix you'll be able to check your website speed through PageSpeed and YSlow in one go. Once you run your check, you'll be presented with an overview dashboard followed by more detailed info grouped into five tabs. By focusing only on page load time, Sucuri Load Time Tester doesn't provide you with that much data, such as those you could get from other online tools. Yet it's still useful if you'd like to test how long it takes to connect to your site and for one page to fully load from 16 different locations worldwide. A more complex tool with plenty of parameters to enable/disable sure is WebPageTest. Thanks to it, you'll be able to test your website performance from more than 40 locations worldwide, have it graded based on 6 types of performance results (those in the image here) and collect tons of data because of its complete reports. With so many tools out there and with so many different scenarios it's almost impossible to provide you with an answer to the question What's the best tool to check my website speed?. On my experience, I'm relying on Pingdom to check and collect data about page load time and server response, and pair it with Google PageSpeed Insights for UX issues and overall speed. Now that you know how to check your website performance and collect data to improve on it, let's move to the next point on the list: get info about your website visitors. Who are your visitors? How many did you have last month? What are they mostly interested in? These are just 3 pretty common questions any website owner, and anybody who's in charge of a website/eCommerce store should be able to provide an answer to. These questions-answers are all tied to knowing the people you're trying to sell your product/service to. Since we're talking about free tools here, the most known and widespread solution is Google Analytics. Probably the most famous of all analytics tools, Google Analytics allows you to collect tons of data related to your website visitors in a given period of time: how many visits, how many uniques, how much time they spent on your website, what pages are the most visited, and so on. Other than that, you could also set up goals and funnels to have a better picture of how visitors use and navigate through your website and eCommerce store. In the video Kathrine uses a plugin from Yoast to add the tracking code to her website but that's not the only way to do it; in fact, you could also manually take care of it by placing it anywhere you see fit (note: usually you should place your tracking code in your footer to prevent your page speed to decrease). If you run an eCommerce store or are interested in digging into data related to your website, you might want to check this video playlist from Google to get the gist of what you can do with GA. Wish to keep these broken pages more under control? Set up custom alert messages. Note: A 404 response isn't bad per se, it is a natural way for removed content to be de-indexed by search engines, but if pages you still have are returning 404 response codes then this is a big problem. Not the complete solution of Google Analytics, Jetpack is still an interesting solution worth mentioning because it provides you with a quick view of how many visits your website got along with a bunch of other interesting info. If you haven't already, you can enable it by navigating to Jetpack > Settings > Engagement in your WordPress install. If you're a fan of Open Source software, then Piwik would be something you should try. They offer 2 different versions of the software and since we're discussing only free tools, you'd need to opt for the self-hosted one and set it up on your own server. There's an enormous flow of attacks throughout any given year (it'll probably get worse) and "just" having a strong password isn't enough. On top of that very basic suggestion, which people keep failing at regularly, it's a matter of compound solutions with strong passwords, two-factor auth plugins, and continuous backups being the 3 pillars to any website that wants to make a hacker's life tougher. One important thing though is to regularly check your website for any vulnerabilities or security threats you haven't realized might affect your website or your eCommerce store. And here are some free tools you could use. 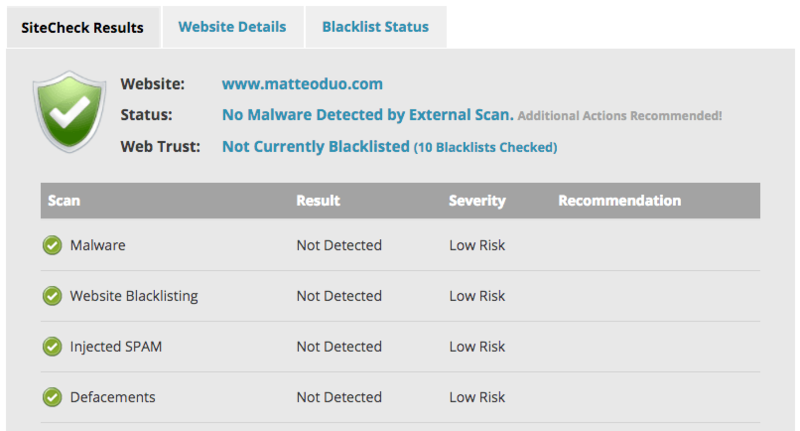 Sucuri also provides an online tool allowing a quick scan for known malware, blacklisting status, website errors, and out-of-date software called Sucuri SiteCheck. Just add your website's URL and click "Scan website! ": in a matter or seconds, without the need to create any account, your website will be scanned. Fast and easy! 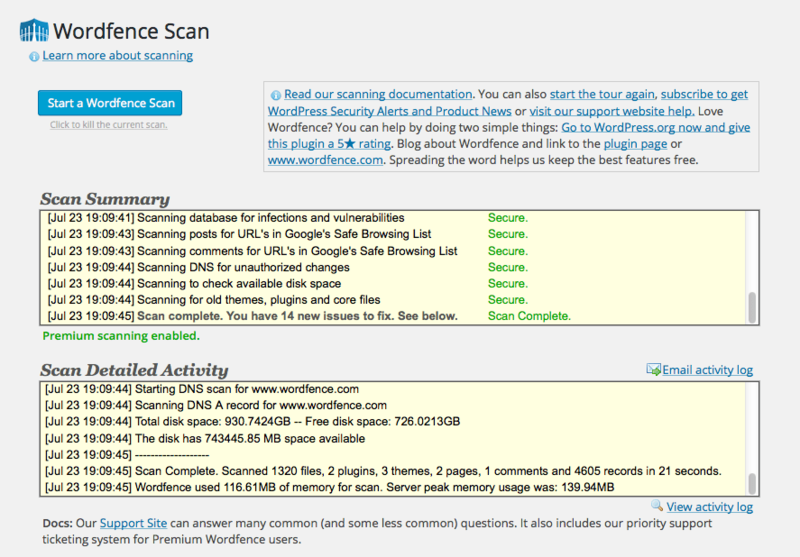 A list of security tools can't be published without featuring a well-known plugin such as Wordfence, which will regularly check your WordPress site for suspicious and malicious code, MySQL injection, and common threats. Given its many features and options, some user might find it hard to use because it requires some time to get used to. Would you always need a WordPress developer, then? No, not always. Yet, the most common flow we've seen is gathering some initial data within a specific area (like speed, for example) and then hire a developer to work on it. The data collected here would be useful to provide you with some real, tangible data and information so you'll be way better at writing your brief or requesting more specific help. Therefore saving you time and money. One the other end, more and more businesses, once they find a reliable WordPress developer they like to work with, they have them regularly taking care of these recurring tasks and reporting on a monthly basis. Note: we're working on Retainers here at Codeable, which are recurring types of projects and tasks you could delegate to an expert for a fixed-recurring price. You'll hear more about them in the coming weeks. With so many tools available, it all comes down to how you use them for your business. If you haven't yet, my suggestion is to start planning regular checks in (at least) these 4 areas to collect data for your website. Then, it's up to you whether to fix all by yourself or hire someone who can take care of some/all professionally. Now it's your turn: What tools do you regularly rely on to check your website? 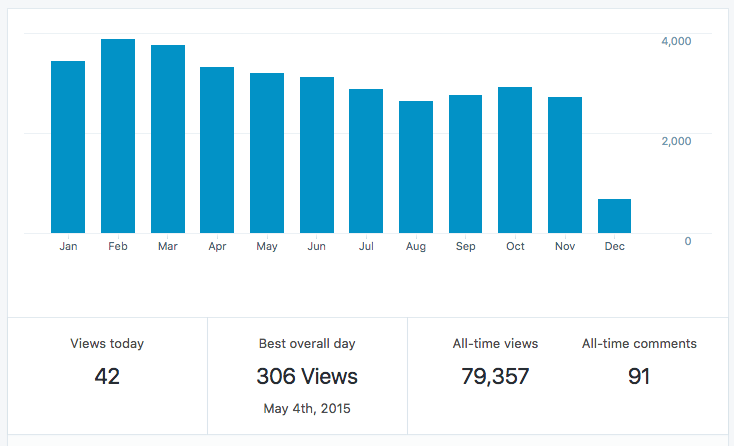 How frequently do you check what's going on with your website? 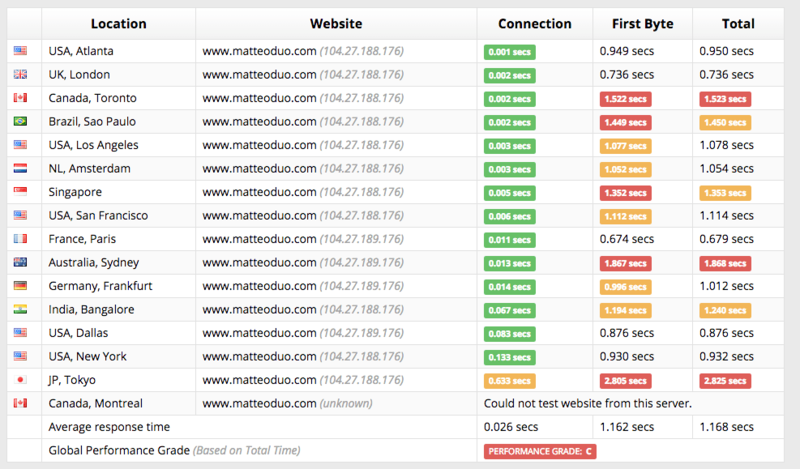 We generally use pingdom to check website status and speed. It’s good tool. It also notify you when your website is down and up again. But it is first time that I have read about creating personal uptime monitor with google spread sheet. I must try it. If it works, it would be great as we don’t need to depend on any third party for it. when I found it the first time I was eager to test it as well. Still, I don’t think relying exclusively on Google Spreadsheet is the best option but using it as a way to check on your hosting provider (as I suggested) might be not a bad idea. Thank you for stopping by! Nice outline. I would add a link checker category – or do the malware/vulnerability scans report on this? I use all these regularly. Up-time monitoring/reporting, performance and Sucuri’s SiteCheck I’ve set up to run automatically though ManageWP. I understand they joined GoDaddy as it is mutually beneficial, providing them with resources to expand their services. btw, I also understand there are better folk on board at GoDaddy now improving the quality of their services. Have you heard anything about this? I use Broken Link Checker by Vladimir Prelovac, the CEO of ManageWP. It’s one of those plugins I picked up years ago, have never had any problems with and so continue to use on all my sites. I get notified by email when there are broken links then go in and check them out at my next convenience. There’s also an option to notify authors of their broken links. Besides being a good thing to do, this may be handy for developing relationships leading to more links to your site. Runs in the background. I have it set to check each link every 12 hours. Can be set to check more or less frequently. It checks new links ASAP. btw, I noticed over time there are certain linked to sites whose links are broken on the weekends then are okay by Monday. I’ve learned to not worry so much about broken links on the weekends, assuming someones working on the site. Please do not use WordFence. That’s nuts. uh we’ve got some “powerful” words here ? Would you mind elaborate a bit more so I can better understand your, I guess, disappointment? That’d be very appreciated ! Is there a proper security plugin for WordPress? As I contributed to several very popular security plugins I’ve found that I have to develop a WordPress WAF. Yes, all are powerful. and I love pingdom but its a paid version. Where else may just anybody get that kind of information in such a perfect means of writing? No prepaid plans – just pay for what you use, after the free trial, of course.